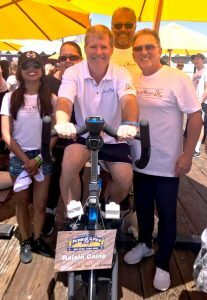 Los Angeles, CA—Caine & Weiner was proud to send a team to participate in the Pedal on the Pier fundraising event June 3, 2018, to benefit the Harold Robinson Foundation. Each team was required to raise a minimum of $2,500; the Caine & Weiner team – Raisin Caine – raised $15,000 for the foundation. Also supporting Raisin Caine was Cami, daughter of Greg & Chris Cohen. Her foundation, Cami’s Clozet, supports the Harold Robinson Foundation with clothing donations for campers. The donations are distributed to kids attending Camp Ubuntu’s 3-day sleepaway retreat. 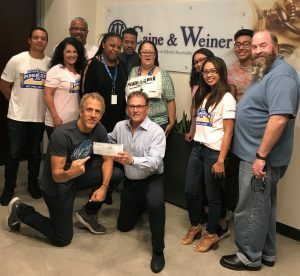 The Caine & Weiner Pedal on the Pier team joins President & CEO Greg Cohen, front, as he presents a check for $15,000 to Co-Founder Jeff Robinson of the Harold Robinson Foundation, for donations raised during their fundraising event to benefit disadvantaged youth in the Los Angeles area. The Raisin Caine team, led by President & CEO Greg Cohen, consisted of Chief of Staff Shamaria Smallis, Chief Commercial Officer Joe Batie, VP Corporate Counsel Steven Friedland, Operations Managers Clay Small and Rogger Virgill, Executive Assistant Maricor Bolado, and Myishea Hudson, Patricia Malki, Jhustin Solero, Yanalte Jovel, and Steven Romero. The team pedaled relay-style for five hours to earn their donations and was supported by a variety of family and friends to encourage and cheer them on. Left, Raisin Caine team members Maricor Bolado, Patricia Malki, Joe Batie and Greg Cohen cheer on Steven Friedland. Right, Rogger Virgill and Clay Small encourage each other to keep pedaling for the kids! The Harold Robinson Foundation was established based on the principle that each and every child deserves opportunities, no matter where they stand on the socioeconomic ladder. HRF provides the funding and resources to send Los Angeles’ less fortunate children to camp, in a safe and nurturing environment, far away from the stress that most of them face on a daily basis. HRF strives to create a sense of purpose and accomplishment in each individual, while working towards building communities through communication and support for schools and families. The mission has grown from the simple hope of allowing youths to experience camp for a weekend to investing in their futures, their families, their schools and their communities. Please watch the following videos to learn more about HRF: Harold Robinson Foundation Videos. 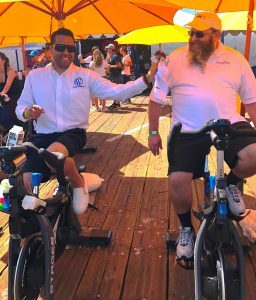 Pedal on the Pier is an outdoor physical philanthropy event with 100+ stationary bikes on the iconic Santa Monica Pier, overlooking the Pacific Ocean. 400+ riders cycle for 5 hours/100 miles with some of the city’s top cycling instructors, while 1,000 family and friends cheer them on. “The funnest fundraiser in Southern California” featured DJ’s, musical and special guests, dancing, vendors and lots of great food and drink. POTP is a high-energy fundraising event which benefits the HAROLD ROBINSON FOUNDATION. HRF is a 501(c)(3) working to improve the lives of our city’s impoverished children by providing them with a camp retreat where they participate in diverse recreational programs that are designed to strengthen confidence, independence, build character and develop leadership skills. The motto of Pedal on the Pier is We Spin, Kids Win! and its goal is to raise $1,000,000 to send underserved kids to camp through the Harold Robinson Foundation. The foundation funds Camp Ubuntu, which brings more than 25 underserved schools on 3-day camp retreats; Ubuntu Watts Day Camp in the heart of Watts; and Parenting from the Heart, a unique parenting program. Caine & Weiner (www.caine-weiner.com) is celebrating 88 years of continuous service as a global provider of highly effective and results-oriented 1st and 3rd party commercial and consumer accounts receivable management services in support of the Receivables-to-Cash Cycle. To serve the domestic market, the global Los Angeles-based enterprise maintains a network of five full-service call centers strategically located throughout the U.S. Through their active partnership with Global Credit Solutions (GCS) and other valued best-in-class international relationships, Caine & Weiner has established an international presence in over 90 countries. Caine & Weiner has supported U.S. commerce in Receivables-to-Cash management since their beginning in 1930 and is a founding member of the former Commercial Collection Agency Association (CCAA), and remains certified by the Commercial Law League of America (CLLA) which is endorsed by the IACC. Caine & Weiner is also a sustaining member of the International Association of Commercial Collectors (IACC), CLLA, and a long-standing member of the American Collectors Association (ACA). The company also recently achieved 2018 SOC 1 Type 2 Audited status awarded by The American Institute of Certified Public Accountants (AICPA). Cami’s Clozet brings fabulous clothes to fabulous kids at sleepaway camp! Through the Harold Robinson Foundation clothes donated allow the inner city kids that visit Camp Ubuntu to go shopping for “free” in a store that is set up especially for them.